When the original PC title The Sims saw release, Maxis treated it as a spin-off of their popular SimCity franchise, the 3000 edition of which included a teaser for upcoming title SimMars. Before Will Wright could say "(insert Sim gibberish here)," though, it proved a sensational success both critically and commercially. 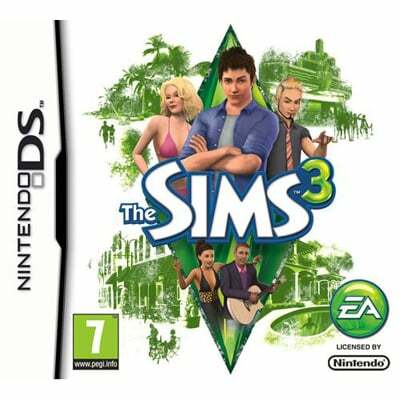 SimMars was cancelled in favour of endless expansion packs and eventually EA founded the separate development house The Sims Studio. They're responsible for the other editions of The Sims 3, but EA shopped out the DS version to Exient, known for the unforgivably downgraded Wii port of Need for Speed: Hot Pursuit. Fortunately, this doesn't suffer the same fate and instead proves to be the Sims game for which DS owners have been waiting. 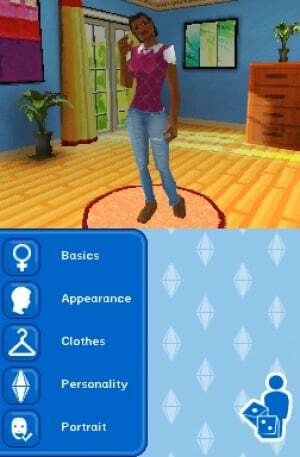 The Sims is an advanced virtual pet, except the subject is a human being. The inevitable follow-up question is whether it can possibly emulate the endless intricacies of real life, and the answer, of course, is no. Whittling down a personality to six basic needs has its problems, but that manageable lack of complexity is part of the series' appeal. Rather than the wants and fears of The Sims 2, here you pick from, along with a decent sized selection of physical attributes, an extensive list of personality traits that calculate out to a choice between four lifetime wishes, which can vary from the simple "success at work" to more interesting choices like "marry a rich Sim," "have ten short term relationships instead of settling down," or "catch 13 types of huge fish." Achieving this will greatly improve your lifetime happiness score and mood, and thus the ease at which life is lived day to day – and, of course, a great feeling of accomplishment, as with any game that you "beat." Along the way, different opportunities and desires will pop up; the former are reminiscent of Grand Theft Auto style missions where a player must befriend or be-foe a certain Sim, convince ten Sims to invest in a business or some such thing, feats that often have monetary rewards attached. The latter gives your Sim a boost in their mood and can involve taking a painting class, getting in a fight and more. You might even impress your boss by running errands. In this way, you design your own game, each session is different and rarely does it feel like you're stuck as different goals and opportunities are almost always readily available to you. A maximum of two Sims can reside in a home, and if you start from scratch, you start with just one. It may seem like an unforgivable reduction, but it's a big step forward from the original PC title, where a family of three was more like an aggregate of strangers that happened to live in a house together than a family. You'll grow attached to your Sim, identify with them and feel compelled to live their life with all the subtlety that exploring the town and interacting with its residents can afford. Still, when everything is boiled down to a medium-sized list of traits and action commands, interactions with other Sims can only get so complex. How you treat others will make a bigger difference than peoples' built-in proclivities, and it's always a lot of fun to woo, fight, boast or complain and see what happens. There are some hiccups that remind you that you're playing a video game – you can chat on the sofa with someone else, but try anything more subtle and both Sims will have to stand up to get anything done, for example. Additionally, in the midst of friendly conversation, a computer-controlled Sim urinated all over the floor, then continued the chat. Talk about the golden years! The developer pitch here is that "what you do outside your home now matters as much as what you do within," and that's true of the handheld version – visiting others is a joy, and trips to the gym, library and dance club can provide some fun as well. There's also a lot to do outdoors; you can jog, explore a graveyard or climb a lighthouse, for example. Too few buildings create an immersive experience, however; most of the time, your Sim will simply travel to a spot – to take a class, go on a date or explore the wasted opportunity of a haunted house – and you'll find yourself simply waiting outside, watching time pass and a progress meter fill. The same goes for your job; while the ability to choose and change your tone from "slack off" to "work hard" and a number of options in between, and thus the effect your work has on your progress up the career ladder, your status meters and mood, it just feels a bit too mechanical. One aspect that separates this handheld version from its console- and computer-based brethren is the predictable cut-back in content. You can't change the terrain levels, for example, and the shop, build and character creation portions are slimmed down, but all the essentials are there and there's still a good selection of options available. We actually enjoyed the paring down; it's so easy to get carried away collecting everything possible or designing a Sim beyond anything you'll ever notice in-game, and judged on its own merits, the content does not seem lacking. Another change is that this version is safe for the whole family; no Sims will woo-hoo here. Unique to The Sims 3 are karma powers, which the tutorial and loading screens constantly remind you of but which vary greatly in usefulness. They'll either help or hurt your Sim to different degrees of superficiality, and are described as "superpowers for your Sim." You unlock them by accomplishing certain tasks, and then must follow a limited set of relatively ineffectual clues to find the object ("something that seems out of place") used to activate one. It's clumsily implemented and the game somewhat overhypes it, but in the end it's just an extra bit of fun to hold your interest. The graphics and sound are what you would expect – nothing to blow you away or terribly impress in either category. The menu layout is one of the biggest problems; everything is a text-free picture, and it can be tricky to remember what's what. There's no easy way to find or identify buildings on the main map, including your home, and the top screen, which displays your info, features as many important sections as bits at which you'll rarely look, so scrolling through them can be a pain – particularly if your shoulder buttons don't work. Besides these hang-ups, the game controls quite smoothly and for the most part you won't have too much trouble. As good as The Sims 3 is, and as many things as there are to do, it can still become tedious after a while as you'll find yourself performing the same actions repeatedly, many of which boil down to choosing a task and waiting to see its effect on your status bars. So many actions are similar to one another in this regard that it all seems to run together after a while, but this still doesn't hurt the game to a great degree and as long as you take a break now and then, you can still have a lot of fun with it. The Sims 3 provides the first open-world experience in the series for a Nintendo handheld, and does quite a good job of it, with enough options, subtlety, neighbours and mini-objectives that there's always something interesting to do. However, the content is limited to a somewhat narrow framework, and overall it's not immersive enough to provide anything much more complex than the original PC game. It's still a lot of fun, though, and while it's more limited and streamlined than its console-based siblings, it's anything but a thoughtlessly reduced port. Argh... I wanted a review of the 3DS version. Way to throw me off guys. Sounds and looks better then the last few Sim DS games. But, since there a 3DS port coming soon, don't know if there going to port the same one. I have enjoyed this game a lot since i bought it last year. At first i thought this was a The Sims 3DS review though, so the screens caught me off guard. Just curious, is there a build mode in this game? Designing a house was always one of my favorite parts of the PC games, but the console versions seem to leave this out. @4: Yes, there is, and although you can't expect the variety of objects present in the PC version, there's quite a lot to choose for building and designing. Kinda lame that you cant have kids. I'll be holding out for the 3DS version that will hopefully take this game to the next level of simamesomeness. Thanks for the nice comments, glad to see you're enjoying the review. @Justao76 I concur with Nightwalker's comment completely. I remember getting so obsessed with expansion packs and user-created downloads for the first game that I ended up doing more collecting stuff than playing it, so the reduced catalogue here, I believe, actually helps, giving just the right amount of stuff to shop for and build with. As long as you understand that the build mode won't be as robust as the home console or PC editions, you can have a lot of fun with the one included here. @JumpMad From the 3DS screens it looks like a version of the Wii edition, but we'll see. @moosa Sorry to disappoint, can you ever forgive me? Even though this looks great I'm still going to wait for the 3DS version. @8.Zach I suppose I can... this time. It just seemed odd timing considering the current 3DS hoopla and how much everyone is waiting for reviews of launch titles that you'd review a DS version of a game that's a 3DS launch title. That being said, I'm sure NL probably doesn't even have a review copy of Sims 3 (3DS) yet, so its not really of any consequence. it looks like the 3DS version will be rated T like all other versions other than this DS version, so that's good. Hopefully that means re-including "woohoo" and actually building a family and killing sims and whatnot. Thanks for the review, hopefully the 3DS improves on all the lack of content related problems. I thought The Sims 3 on DS was a huge letdown. While I was fine with the 2 Sim cap, the fact that I can't evict a non-spousal housemate is a huge annoyance (at least I haven't been able to figure out how despite having many an argument/fight with said roomie). It's also disappointing that the housemate must be one of the NPCs in the game. Surely EA could have given us the option of creating 2 Sims from scratch. I would much rather have seen a port of The Sims 1 on DS (which was a 2D game with 3D character models, as this would have looked and run far better on the DS) in favour of this unsightly fully 3D game. While the environments look fine from a distance, up close, the 3D models look horrendously undetailed, and the character models look alien-like with their bulging eyes and imposingly enormous cheekbones. Even The Sims 2, which was released way back in 2005, puts The Sims 3 to shame both graphically and aurally. The Sims 2 had far shorter loading times too. There simply isn't enough to do here given the constraints of the hardware (and you're forced to WAIT while your Sim goes to work/sleep, and setting the game to fast forward does little to hasten the process), and the technical constraints of the DS keep this from becoming what this game should have been. They've placed so much emphasis on replicating the PC experience of The Sims 3 that they've overlooked the strengths and weaknesses of the DS. Anyone looking for a Sims game on DS should stick with The Sims 2 (and this alone, don't bother with the likes of Pets, Castaway or Apartment Pets as they're all rubbish). While The Sims 2 on DS isn't set against the same suburban/residential backdrop of its PC brethren, there's plenty more to see, do and unlock. And while you're not afforded the same flexibility as TS3 in terms of structuring and building your living quarters, you still have full control over the furnishings that occupy your domicile. 7/10 was far too generous TBH. And while I'm not terribly familiar with you guys here, I know that James Newton would have ripped this game to shreds (and with good reason =P). With that said, I'm looking forward to picking up The Sims 3 on 3DS at launch as it looks far more polished and faithful to the Sims experience than this bastardised DS version. @sillygostly Everyone's entitled to their own opinion, but there's no telling what James would have given it. And 7/10 isn't out of the ordinary, it has a 73% on Metacritic - NGamer UK gave it a 69%, GameShark gave it a 58% and all the rest are 70% or above. If James ripped this to shreds, he'd be far in the minority. I agree that the loading and waiting around are somewhat annoying, and that it's not the prettiest game, but none of this detracted too much from my experience. 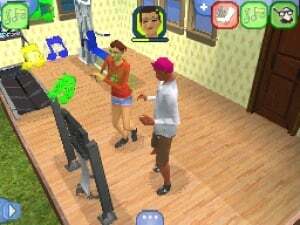 Besides, once you have two Sims you can just focus on the one while the other goes to work or sleeps, and if they wake up they'll start doing stuff on their own, so you don't necessarily have to wait around then. Yep, everyone has their own opinion. I personally think these Sims games are the most idiotic excuse for games I've ever seen, but that's just me. So...any word on that Sims 3 3DS review? The Sims 3 game for DS isn't as good as you think. Once you win the Lifetime Wish it gets pretty boring. Why is it 7+? Please don't tell me woohoo is gone? Or what about killing sims? Or that kind of stuff? Is that all gone? Cuz if it is, than am i not about to buy it (that makes it complete). srry, I forgot you cant kill sims. But they can die. Can they still die? and can they still do woohoo? and that kind of stuff? all right, sorry, i still bought it, because i had some money back from the webstore, and it is a really fun game. But i think the creators didn't put enough effort in it. I mean, there are some errors in the game. Like, when you give your sim some things to do, than youre going to check your sim at work, and than youre going back to the other sim, than he/she probably forgot what to do. And my sim, he had brown hear and no beard, but suddenly, his hair was gone and he had a blond beard. Good thing that can be fixed by changing its outfit, but its still weird. And unfortanly there are no kids. Just adults.